Under 15 PFA Cup winners Peterborough Sports. 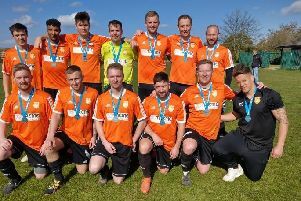 There were PFA Cup final wins for city sides Peterborough Sports Under 15s and Northern Star Under 18s yesterday (April 9). Peterborough Sports, the Peterborough Youth League KO Cup winners and Division One champions, completed a trophy treble by thrashing Leverington Sports 10-0 in the Under 15 decider. Under 15 PFA Cup runners-up Leverington. Bradley Gilbert led the way with a magnificent seven goals and completing the rout were Nasir Nabi, Taylor Steward and Tychique Muendo. Gilbert has now scored 52 goals for the season. Peterborough Sports line-up: Calum Arden, Olutayo Arinsanya, Jazleigh Fife, Bradley Gilbert, Lewis Lamberton-Pine, Nasir Nabi, Alex Pacey, Sean Spalding, Taylor Steward, Louie Venni, George Warrington. Subs: Josh Dunmore, Aaron Morling, Tychique Muendo, Jay Ward. Leverington line-up: Michael Bailey, Josh Balding, Billy Barnes, Lewis Curson, Lewis Day, Jake Gadsen, Louie Garner, Kyle Jenkins, Daniel Kimber, Dylan Pevreall, Kyle Smith. Subs: Lewis Clarke, Joseph Lewis, Lukas Sakavicius. The Under 18 final match-up was the same as the Youth League KO Cup final as Division One title-chasers Northern Star came up against Division Three side March Soccer School. Under 18 PFA Cup winners Northern Star. Once again there was a win for Star but it was a lot closer this time. In the KO Cup final Star won 7-0 but yesterday they needed a penalty shoot-out to beat the Fen boys. They won it 5-4 after a goalless draw. Under 18 PFA Cup runners-up March Soccer School.